An offer, received today from Corney & Barrow in London, for a mouthwatering array of white burgundies straight from the cellar of Domaine Leflaive prompted an indulgent bout of wishful thinking and brought back some memories too. In the whole world of wine there is hardly a more exalted name than that of Domaine Leflaive in Puligny-Montrachet. Presided over by Anne-Claude Leflaive this domaine, along with just a few others such as Coche-Dury, sets the benchmark for white burgundy year after year. 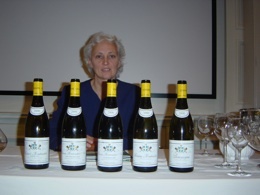 Anne-Claude came to Ireland in 2002 to conduct a tasting of the infant 2000 vintage at Sheen Falls Lodge in Kenmare and those who were there still talk of the extraordinary quality of the quintet of wines tasted that day, from a far from humble Bourgogne Blanc up to a majestic Chevalier-Montrachet. She will be back in Ireland in June, hosting a dinner at Ballymaloe House on Saturday, 11th June. (www.ballymaloe.ie). Decanted wines ready for pouring, left, and Anne-Claude Leflaive after the 2002 tasting, right. But what of the current offer? It features wines mainly from the 2006 vintage, with just a handful from 2007. Speaking of white wines generally, which is a dangerous thing to do with burgundy, I favour the leaner 2007 vintage over the more sumptuous 2006. So it might be a good idea to keep your hands in your pockets and hope that a similar offer will be made next year. 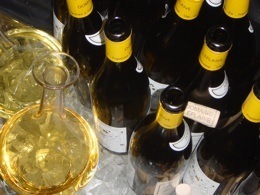 Or, if temptation proves too strong, satisfy yourself with the Bourgogne Blanc 2007. The great imponderable here and with all with modern white burgundies of five years and older is, of course, the dreaded scourge that is premature oxidation (premox for short), which has plagued white burgundy in recent years. 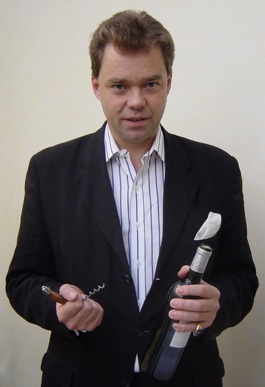 Not so long ago I raided the piggy bank and splashed out on a case of Leflaive Bourgogne Blanc 2005 and to date have opened five bottles – but only drunk two, because of premox. The dodgy trio had the unmistakable dull colour and heavy, marzipan-like aroma, while the other two were superb. 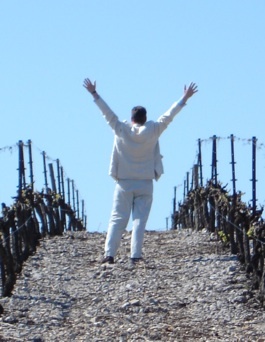 Buying white burgundy from the decade 1995-2005 really is a game of Russian roulette. I suggest that, before handing over any cash, you get an absolute guarantee from your merchant that he will refund for any sub-standard bottles no matter how long after purchase they are returned. NB Domaine Leflaive is not to be confused with the separate negociant business of Olivier Leflaive who is a cousin of Anne-Claude Leflaive.